From this it will be clear that there is an etiquette and rulings which must be fulfilled, in the du’aa’ and in the person making the du’aa’. There are also things that may prevent the du’aa’ reaching Allaah or being answered – these things must be removed from the person making the du’aa’ and from the du’aa’. When all of these conditions are fulfilled, then the du’aa’ may be answered. “So, call you (O Muhammad and the believers) upon (or invoke) Allaah making (your) worship pure for Him (Alone) (by worshipping none but Him and by doing religious deeds sincerely for Allaah’s sake only and not to show off and not to set up rivals with Him in worship)” [Ghaafir 40:14]. Sincerity in du’aa’ means having the firm belief that the One upon Whom you are calling – Allaah, may He be glorified and exalted – is alone Able to meet your need, and it also means avoiding any kind of showing off in your du’aa’. 3. Beseeching, humbling oneself, hoping for Allaah’s reward and fearing His punishment. This is the spirit, essence and purpose of du’aa’. Allaah says (interpretation of the meaning): “Invoke your Lord with humility and in secret. He likes not the aggressors” [al-A’raaf 7:55]. 4. Urgently beseeching and repeating the du’aa’, without getting exasperated or bored; this is achieved by repeating the du’aa’ two or three times. Restricting it to three times is preferable, in accordance with the Sunnah of the Prophet (peace and blessings of Allaah be upon him). Ibn Mas’ood (may Allaah be pleased with him) narrated that the Prophet (peace and blessings of Allaah be upon him) liked to say a du’aa’ three times and ask for forgiveness three times. This was narrated by Abu Dawood and al-Nasaa’i. 5. Making du’aa’ at times of ease, and saying more du’aa’s at times of plenty. The Prophet (peace and blessings of Allaah be upon him) said: “Remember Allaah during times of ease and He will remember you during times of hardship.” Narrated by Ahmad. 6. Seeking to draw closer to Allaah by calling upon Him by His Most Beautiful Names and Sublime Attributes at the beginning of the du’aa’ or at the end. Allaah says (interpretation of the meaning): “And (all) the Most Beautiful Names belong to Allaah, so call on Him by them” [al-A’raaf 7:180]. 7. Choosing the clearest and most concise words and the best of du’aa’s. The best of du’aa’s are the du’aa’s of the Prophet (peace and blessings of Allaah be upon him), but it is permissible to say other words according to the specific needs of a person. Other aspects of the etiquette of making du’aa’, although they are not waajib (obligatory), are: to face the Qiblah; to make du’aa’ in a state of tahaarah (purity); to start the du’aa’ with praise of Allaah and blessings upon the Prophet (peace and blessings of Allaah be upon him). It is also prescribed to raise the hands when making du’aa’. One of the things that helps to bring a response to du’aa’ is to seek the best times and places. Among the best times is the time just before Fajr (dawn), the last third of the night, the last hour of Jumu’ah (Friday), when rain is falling, and between the Adhaan and iqaamah. Among the situations in which du’aa’ is more likely to be answered are: when one is mistreated or oppressed, when one is travelling, when one is fasting, when one is in desperate need, and when a Muslim makes du’aa’ for his brother in his absence. 1. When the du’aa’ is weak in itself, because it involves something inappropriate, or involves bad manners towards Allaah, may He be exalted, or it is inappropriate, which means asking Allaah for something which it is not permitted to ask, e.g. when a man asks to live forever in this world, or he asks for a sin or something haraam, or he prays that he will die, and so on. Abu Hurayrah (may Allaah be pleased with him) said: The Messenger of Allaah (peace and blessings of Allaah be upon him) said: “A person's du’aa’s will continue to be answered so long as he does not pray for something sinful or for the breaking of family ties.” Narrated by Muslim. 2. When the person who is making du’aa’ is weak in himself, because he is faint-hearted in his turning towards Allaah. This may be either because of bad manners towards Allaah, may He be exalted – such as raising his voice in du’aa’ or making du’aa’ in the manner of one who thinks he has no need of Allaah; or because he pays too much attention to the wording and tries to come up with unnecessarily ornate phrases, without paying attention to the meaning; or because he tries too hard to weep or shout without really feeling it, or he goes to extremes in that. 3. 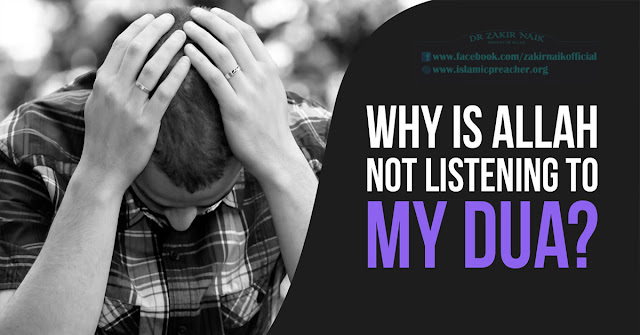 The reason why his du’aa’ is not answered may be because he has done something that Allaah has forbidden, such as having haraam wealth – whether it be food or drink or clothing or accommodation or transportation, or he has taken a haraam job, or the stain of sin is still in his heart, or he is following bid’ah (innovation) in religion, or his heart has been overtaken by negligence. Then he mentioned a man who has travelled on a long journey and is dishevelled and covered with dust; he stretches forth his hands to the heaven, (saying) “O Lord, O Lord”, but his food is haraam, his drink is haraam, all his nourishment is haraam, so how can he du’aa’ be accepted?” Narrated by Muslim. The man described by the Prophet (peace and blessings of Allaah be upon him) had some of the characteristics which help du’aa’s to be answered – he was travelling and he was in need of Allaah, may He be exalted and glorified – but the fact that he consumed haraam wealth prevented his du’aa’ from being answered. We ask Allaah to keep us safe and sound. 5. Trying to hasten the response. Abu Hurayrah (may Allaah be pleased with him) said: the Messenger of Allaah (peace and blessings of Allaah be upon him) said: “The du’aa’ of any one of you will be answered so long as he is not impatient and says, ‘I made du’aa’ but it was not answered.’” Narrated by al-Bukhaari and Muslim. 6. Making the du’aa’ conditional, such as saying, “O Allaah, forgive me if You will” or “O Allaah, have mercy upon me if You will.” The person who makes du’aa’ has to be resolute in his supplication, striving hard and earnestly repeating his du’aa’. The Prophet (peace and blessings of Allaah be upon him) said: “Let not any one of you say, ‘O Allaah, forgive me if You will, O Allaah, have mercy on me if You will.’ Let him be resolute in the matter, whilst knowing that no one can compel Allaah to do anything.” Narrated by al-Bukhaari and Muslim. In order for du’aa’s to be answered, it is not essential to adhere to all of these points and be free of all that could prevent one’s du’aa’s from being answered. That is something which happens very rarely. But one has to try hard and strive towards achieving this. Another important point is to realize that the response to the du’aa’ may take different forms: either Allaah will respond and fulfil the desire of the person who made the du’aa’, or He will ward off some evil from him because of the du’aa’, or He will make something good easy for him to attain because of it, or He will save it with Him for him on the Day of Resurrection when he will be most in need of it. And Allaah knows best.